Here are a couple of suggestions on how you can personalise the free PinBroidery prick and stitch flower corners pattern. The first one has been stitched without the words Happy Birthday. It is mounted on a gold greetings card. 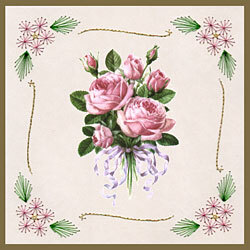 Rose clip art has been added to the centre. The bouquet of pink roses with a light purple bow clip art is available from HellasMultimedia.com and is used here with kind permission. The second version of the PinBroidery flower corners pattern is stitched complete with the Happy Birthday greeting. 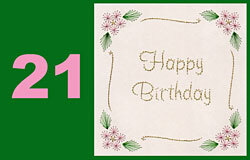 This is mounted on dark green greetings card with the number 21 cut from pink paper. The type face usedÂ for the number is Arial Black. This was printed as an outline font as a guide for cutting. Any TrueType font can be converted to an outline. Type your number in a program such as Word. Click on “Format” (usually found near the top of the page), select “Font..” from the dropdown list. An options box should appear. Under “Effects” select “Outline”. Close the box and your number will show as an outline. Have you made an interesting variation on the flower corners pattern? If you would like us to show your card here then send it to us by email. This entry was posted in PinBroidery and tagged free pattern on Tuesday 17 February 2009 by David Jefferson.